FILE - U.S. Army General John Nicholson, commander of Resolute Support forces and U.S. forces in Afghanistan, speaks with Afghan police special forces after they took part in a military exercise in Logar province, Afghanistan, Nov. 30, 2017. Russia is not giving up on efforts to destabilize Afghanistan and drive divisions between the United States and its coalition partners, according to the outgoing commander of U.S. forces in the country. The commander of U.S. Forces-Afghanistan and of Operation Resolute Support, General John Nicholson, is scheduled to step down Sunday after serving in the position for more than two years. But before relinquishing command, he took time to cast doubts on Russia's intentions in the region, despite recent overtures from Moscow to help the Taliban reconcile with the Afghan government. "We know that Russia is attempting to undercut our military gains and years of military progress in Afghanistan, and make partners question Afghanistan's stability," Nicholson said in an email to Voice of America, following on questions from his August 22 briefing with Pentagon reporters. An Afghan security officer arrives at an area near a house where attackers are hiding, in Kabul, Afghanistan, Aug. 21, 2018. Russia was set to host Taliban and Afghan government representatives for talks starting September 4, but was forced to postpone after Afghan President Ashraf Ghani declined the invitation. "It is no secret that Russia seeks any opportunity it can find to drive a wedge between the United States and our Central Asian partners, including Afghanistan," Nicholson added. U.S. and Afghan officials have previously accused Russia of meddling in Afghanistan by providing Taliban insurgents with both weapons and training. 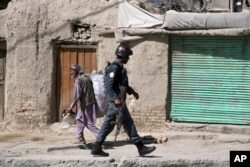 Moscow has rejected the allegations, saying it has only political ties with the Taliban. Still, Russia has faced growing suspicion from the U.S. and its allies, who say the Kremlin has been increasingly working to expand its influence in Afghanistan and beyond. Most recently, the U.S. and Russia have been competing over efforts to kick-start peace negotiations between the Taliban and the U.S.-backed Afghan government. Russia was set to host both parties, along with the U.S. and other countries, for talks starting September 4, but was forced to postpone after Afghan President Ashraf Ghani declined the invitation. The U.S. also has been hoping for talks between the government and the Taliban. "We talk about an Afghan-led, Afghan-owned reconciliation process," U.S. Defense Secretary James Mattis said during a briefing with reporters this past week. "We believe that the best way to get there is to ensure Taliban recognizes they can't win on the battlefield, they must negotiate." But while U.S. officials have touted what they see are signs of progress, including increased support for a peace process from various sectors of the Afghan population, the government's recent cease-fire offer to the Taliban appears to have fallen on deaf ears. Meanwhile, U.S. officials have been angered by what they see as Russian efforts to derail peace and stabilization efforts with disinformation campaigns. FILE - Russian Foreign Ministry spokeswoman Maria Zakharova speaks to the media in Moscow, March 29, 2018. Just over a week ago, Russian Foreign Ministry spokeswoman Maria Zakharova raised concerns about "unidentified" helicopters flying missions in support of fighters for the Islamic State terror group, also known as IS-Khorasan or IS-K, in the northern Sar-e-Pul province, suggesting the U.S. and NATO might be responsible. "Who is arming the terrorists and secretly creating their bases?" she asked. "Why is this happening if NATO command is effectively in control of Afghanistan's airspace?" Pentagon officials rejected the suggestion of U.S. or NATO involvement as "completely untrue," noting it was not the first time Moscow had levied such charges. "As they [Russia] perpetuate false narratives about ISIS-K, the United States and the Afghan Special Security Forces eliminated the Jowzjan ISIS-K enclave and are killing ISIS-K leaders and fighters in Nangarhar," Nicholson said in his statement to VOA. Still, the outgoing commander said he held out hope Russia could play a constructive role. "We have shared interests with Russia in Afghanistan — peace, counterterrorism and counternarcotics," Nicholson said. "We hope to see Russia support Afghanistan and the NATO-led coalition in these areas going forward."